A special character selection was made for the Jumbo Pavé Series, which used real crystals on the characters dresses. The characters were Alice, Aurora, Cinderella, Belle, Tiana, Jessica Rabbit, Tinker Bell and Snow White. Jessica is standing in front of a heart pattern design which has pink pearlized fill. Her dress has seventeen pink pavé crystals. 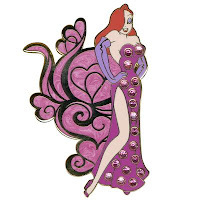 In the earlier days of Jessica's pin releases, she and Tinker Bell were often included with the Disney Princesses, much like this series.